This research project aimed to understand and explore the ways electronically networked (e-networked) tools can support authentic science inquiry in junior secondary classrooms in order to address concerns about student engagement in science. Internationally claims are made about the potential for inquiry-based learning to address the challenges of relevance for the 21st century school science learner (Aikenhead, 2005; Bolstad & Hipkins, 2008). Deliberate inclusion of activities such as collaboration, co-construction and confirmation of ideas is appropriate and valued in science inquiry but they tend to contrast with many of the practices found in conventional classrooms. These activities require more student freedom and the capacity to pose and meaningfully pursue questions of their own design. They may also require students to go beyond the confines of the physical classroom, and venture into virtual communication environments. Our findings highlight that e-networked tools can support collaboration and the co-construction of knowledge within and across an inquiry cycle. Tools such as online platforms, Skype, and mobile technology afford new and different ways of communication and the sharing of information and ideas through synchronous and asynchronous, direct and indirect means. The findings also point to the conditions that are needed to leverage the potential of these e-networked tools in junior secondary science classrooms. E-networked tools are valuable in supporting an inquiry approach to teaching and learning science. E-networked tool use enables greater student control, ownership and responsibility for their learning, by affording them access to a wider range of sources of knowledge and resources and media for communicating what they know and can do. Meaningful integration of e-networked tools in the inquiry process requires that teachers have sufficient support from their school/school management, flexibility in curriculum design, and active planning to integrate and implement e-networking tools, including scaffolding students’ developing understanding of the inquiry process and outcomes and the affordances of the different ICT tools. 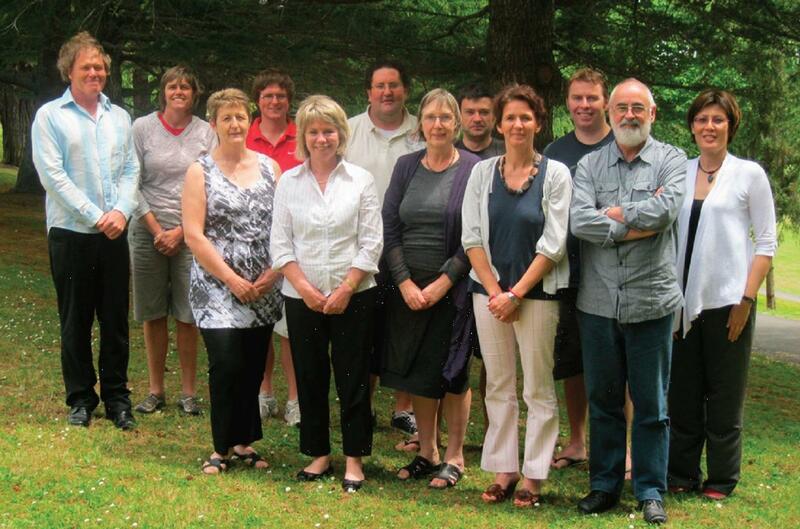 From left to right: Simon Taylor, Michelle Ballard, Shirley Dudli, Shannon Andrews, Kathy Saunders, Darron Cutler, Bronwen Cowie, Jim Critchley, Kathrin Otrel-Cass, Craig Taylor, John Williams and Elaine Khoo. The Networked Inquiry Learning in Secondary Science classrooms research project aims to understand what networked inquiry learning looks like in junior secondary science classrooms. We are investigating evidence to understand the relationship between actors (students and teachers) and the goals and science outcomes (broadly defined) of their inquiries, the communities they belong to and access, and the tools that help them (or not) to achieve these goals. We consider how the nature of the inquiries is shaped by the affordances of the tools used and accessed and by the rules that exist between community members. The project focuses on student learning outcomes in science and traces how individuals and groups of students and their teachers re-shape patterns of social interaction towards those more conducive to scientific inquiry processes with and through the use of networked online resources and support. The Utube video clips are one of the outcomes of an inquiry activity in one of the schools. The students worked in groups, and were to produce a video clip which represented an ethical inquiry into a social issue in chemistry. The projects will be marked according to the level of science understanding (especially chemistry) as well as the justification of students’ decisions and their ethical considerations. Artistic ability would not be a consideration although the ‘hit rate’ on Utube will be considered, but will not have a large influence on the marks. Khoo, E., Williams, J., Otrel-Cass, K., Cutler, D., Ballard, M., & Critchley, J. (2012, July 1–4).Observing, recording, and reviewing: Using mobile phones in support of science inquiry. Paper presented at The 43rd Annual Conference of the Australasian Science Education Research Association (ASERA), University of the Sunshine Coast, Australia. Saunders, K., Khoo, E., Otrel-Cass, K., Taylor, S., Cutler, D., Andrews, S., Taylor, C., Dudli, S., & Critchley, J. (2012, July 1–4). “We were learning from each other”: E-tools that support science inquiry. Paper presented at the NZASE Science Conference 2012 (SciCon 2012), University of Auckland, New Zealand.